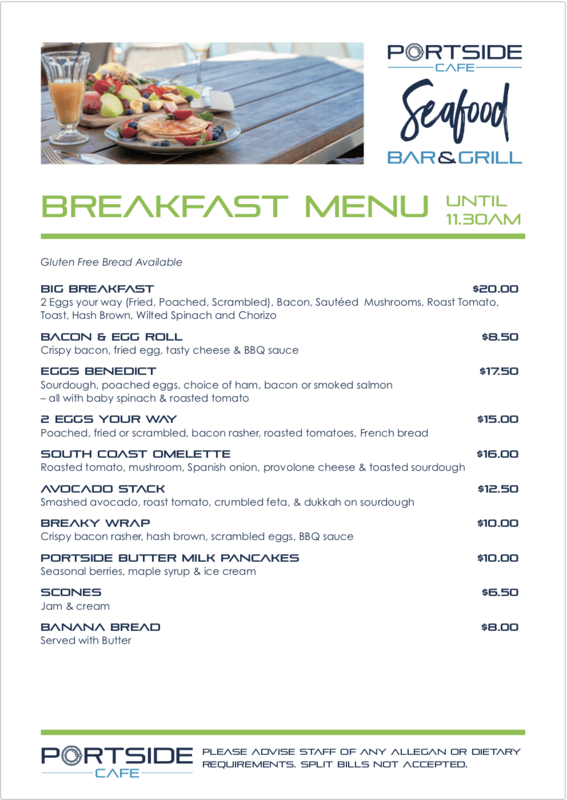 Open from 9am Weekdays and 8am Weekends. Located right on the Wharf at Huskisson. (Times may vary during Holiday periods). 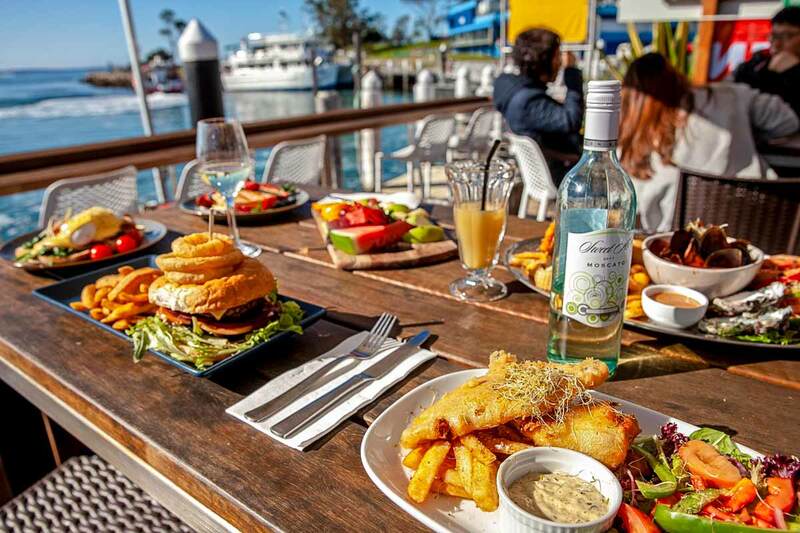 Whether you’re booked in for our dolphin cruise, our whale watching tour, or another of our wildlife-focused excursions, a meal or quick snack at the Portside Cafe presents a nice bookend to your day out. Most of our cruises depart in the late morning or early afternoon hours. This allows for the perfect schedule to start your day enjoying a hot, steaming coffee as you sit overlooking the water. 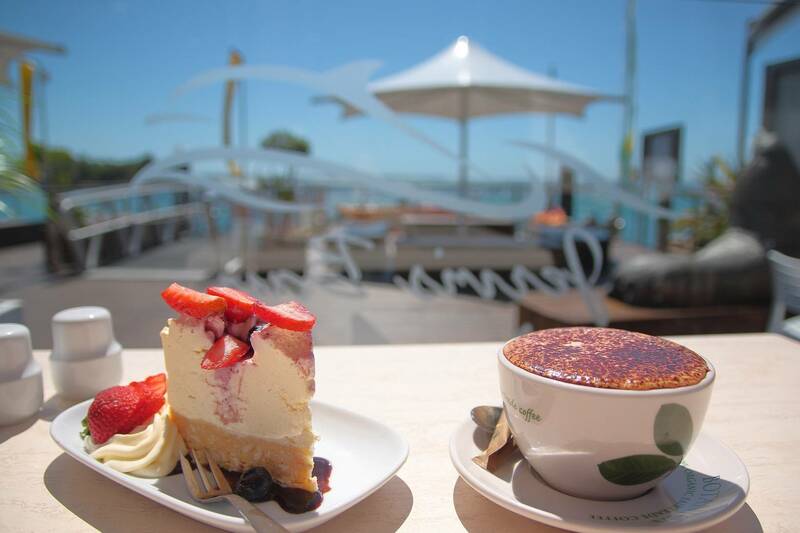 As you savour your cuppa, you’ll be able to watch the happy activity of boats sailing to and fro–we’re attached directly to the Jervis Bay Wild Cruise Terminal. 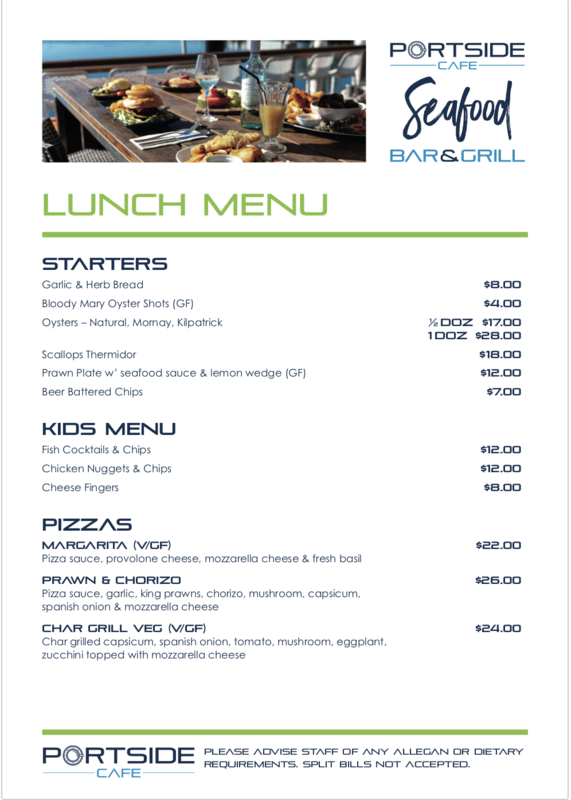 If you’re heading out on an afternoon tour, pop in to pay us a visit for an energising lunch. 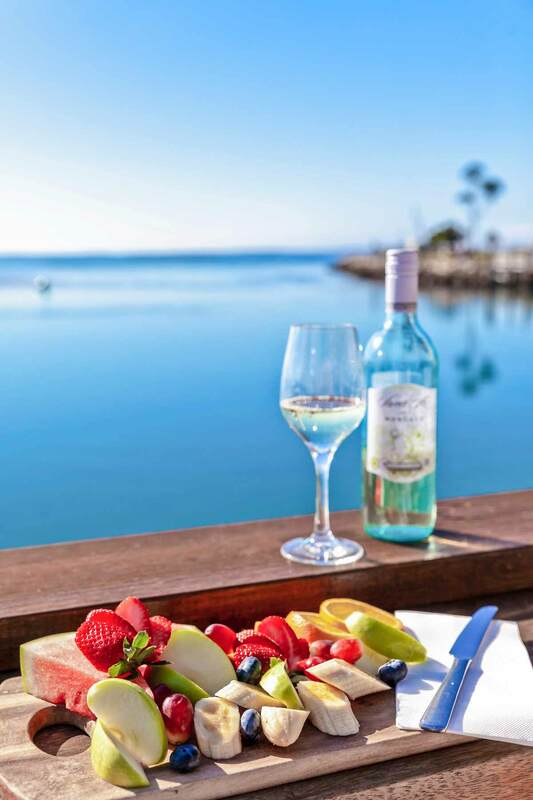 The perfect place to grab a bite to eat…Our restaurant boasts some of the finest views overlooking the waters of Jervis Bay and offers quality service at great prices. If you are seeking a relaxed spot where the atmosphere is laid back and low key, we have your table waiting. 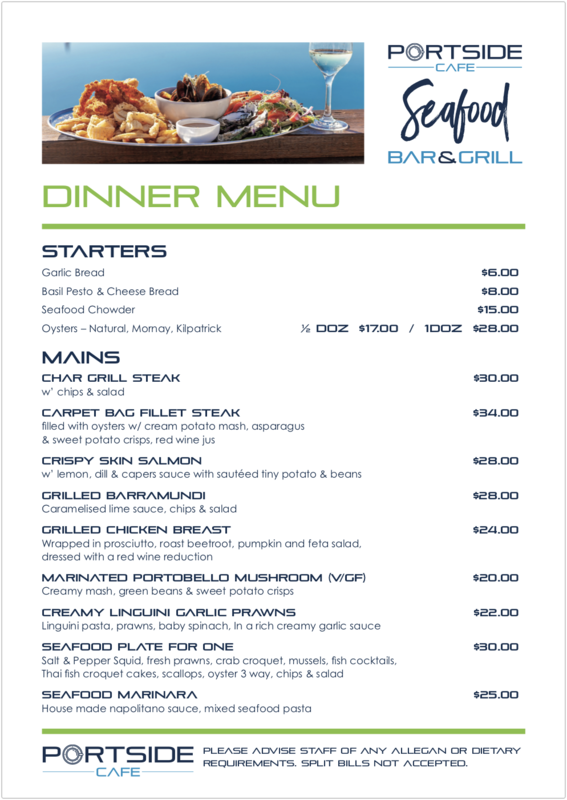 We are striving to bring you a unique and delicious dining experience, with an emphasis on local flavours and the freshest of Seafood dishes. If you’ve already eaten your meals, a prime way to celebrate a wonderful and successful cruise is to enjoy a tasty dessert in our cafe. The bright flavours of sugar and sweetness provide a fantastic finish to an afternoon spent in the brisk and salty sea air. As you and your travelling companions dive into your cakes and pastries, you’ll have a ball recounting tales of the wildlife you spotted on your cruise. Compare the photos of dolphins, fur seals, and whales that you snapped over espresso, or sit back and relax with a snack.